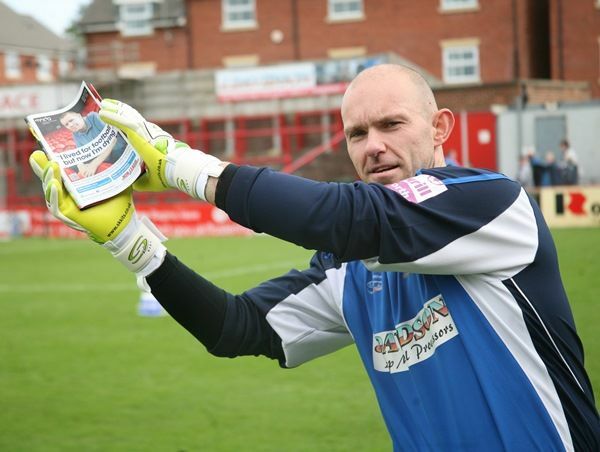 Mark Maddox was an inspirational captain and player for Altrincham FC and now he is providing inspiration to thousands of fellow-sufferers of Motor Neurone Disease (MND) with his fundraising and publicity work for the MND Association. Not only has he played football and completed marathons since being affected by the Disease, Mark has become a figurehead of the Association's activities. Altrincham FC is delighted to help Mark and the MNDA in whatever way it can. He gave a lot to the Club; now it is for the Club to work hard on his behalf and that of his fellow MND sufferers. Details of Mark's career at Altrincham FC are to be found in Terry Rowley's Alty Legends appreciation. Please click on the poster Of Mark, right, or on the MNDA logo, above, to learn about MND and how you can help. Before Saturday's game against Guiseley a number of current Altrincham players posed for photos to assist the publicity campaign for the Motor Neurone Disease Association (MNDA). The MNDA seeks to raise funds and to make people more aware of the disease. Above, we see Mark Maddox's former team-mate, goalkeeper Stuart Coburn, "saving" the MNDA's striking poster which features Mark. This website now has a page devoted to Mark's campaigning for the MNDA, which can be found in the Community section of the site, here. The Motor Neurone Disease Association reports that "Mark Maddox made 300 appearances as a footballer but now he has MND and will never play again. 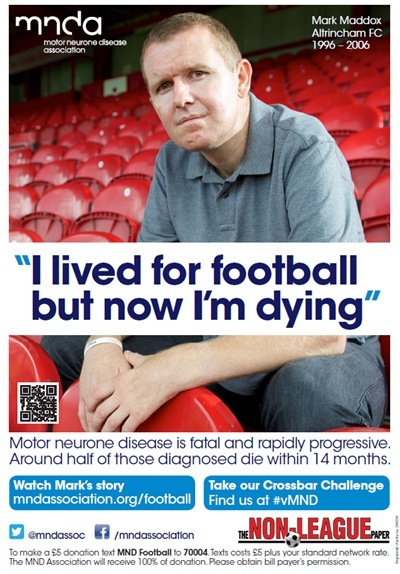 Football v MND is Mark's mission to raise awareness of this progressive and fatal disease amongst Britain's footballing community. MND means Mark won't get to another 300 games in person, but by using his awareness poster, we can still reach thousands of people". The poster is only available via the above link.